(CNS): After a career of almost 40 years, theformer acting CEO of the Cayman Islands Airports Authority (CIAA), Kerith McCoy, has retired in the face of a major shake-up of operations at the airport. Caren Thompson-Palacio, CIAA Business Development & Marketing Manager and Information Manager, has also resigned. McCoy formally departs on 14 February and Thompson-Palacio, who said she is pursuing other interests, will depart at the end of February. This latest news comes after a year of scandal at the authority, which began with the suspension and eventual sacking of the pervious airport boss, Jeremy Jackson, and the dismissal of the financial controller, Shelly Ware. A report given to the previous board last year suggested that money was being misspent and the authority mismanaged. The board itself also became embroiled in the scandal when the extent of the conflicts among the membership was revealed. Since then, Ware has filed a law suit in an effort to get her job back. A new board has now been appointed, which announced a review of the entire operations at the facility ahead of plans for the redevelopment and expansion of Owen Roberts International Airport on Grand Cayman, refurbishment at the airport on Cayman Brac and the possibility of a new runway and airport terminal on Little Cayman. The former financial controller is seeking a finding from the courts that not only was there no misconduct on her part but that she was an exemplary employee. In addition, it is understood that Jackson is also planning some form of legal action regarding his treatment. When both Ware and Jackson were dismissed, McCoy was appointed by the former board as the new CEO. Shortly afterwards details of the extent of the conflicts of interest facing several of the board members were revealed and when the PPM took office it was one of the first statutory authority boards to be overhauled. The new board then set about reviewing the operations. During that time they reshuffled the staff, moving McCoy, who had taken extended leave as a result or accumulated vacation, from the top job into another position and replacing him with Andrew McLaughlin. In an email sent to friends, colleagues and business associates on 29 January McCoy announced his decision to retire from the Cayman Islands Airports Authority. “I’ve thought hard about this and must admit that after a controversial and demanding 2013 coming shortly after illness,” he said, adding that he had decided that retirement was an "attractive route at this time in my life.” Thompson also stated that her departure was nothing more than a coincidence and had nothing to do with the current review of operations. The authority is now seeking a full time CEO, a business development manager and a human resource manager after a previous recruitment attempt also caused further controversy. Although a number of Caymanians had applied for the post, including at least once qualified candidate, the CIAA opted for an expatriate, who was ultimately refused a work permit. As a result the post was re-advertised and a new selection process started. (CNS): Shane Bodden, who was found guilty of shooting at another man over a missing cap, has been handed a four year jail term by a visiting Jamaican judge. As the crown never recovered the weapon and the slight abrasion sustained by the victim was not confirmed as a bullet wound, Bodden escaped the mandatory minimum sentence of ten years for possession of the weapon but will still be leaving his three children, all aged under ten, fatherless for a considerable period. Justice Carol Beswick pointed to a number of reasons for the prison term, not least Bodden’s rap sheet, as she said he seemed “determined to pursue a criminal career”. Bodden committed the offence while on bail regarding allegations for other offences, which she said was an aggravating factor, coupled with the long list of serious previous offences for violence including assault, GBH, carrying an offensive weapon and damage to property. Pointing out that firearms offences are considered very serious, the judge pointed out that there were few mitigating circumstances other than the fact that Bodden’s victim has been quick enough on his feet to avoid the bullet and as a result escaped with a mere scratch. Had that not been the case, however, the circumstances could have been worse. The judge acknowledged that Bodden was a family man in a stable relationship with his common law wife of some eleven years and that as a qualified electrician he was the main breadwinner. Nevertheless, despite hearing that the family was struggling without him since he was remanded in custody, she handed down the four year term. Justice Beswick told the defendant that when he was released from prison, she trusted he would use the opportunity to embrace his family and move away from his criminal career. Bodden was convicted of firing an unknown weapon at Joseph Ebanks during an altercation at a property in West Bay last August. He had denied being the person who shot at Ebanks, who received a graze to his shoulder because, he told the court, he turned and ducked at the time of the incident. Bodden said he was at home at the time with his family. Although Bodden's partner testified on his behalf, the judge rejected her evidence. With no bullet or casings found, no gun recovered and a difficulty for medical staff to confirm Ebanks’ injury was caused by a bullet, the crown proceeded against Bodden with a charge of possession of an imitation firearm with intent rather than with the real thing. He was also charged with wounded and threats to kill. The judge, however, dropped the wounding charge and changed it to common assault following an application by the defence. Having found him guilty at the end of a judge alone trial of all three charges, she also sentenced Bodden to six months for the commons assault and three years for the threats to kill, all of which were to run concurrently with the four years for the imitation gun. 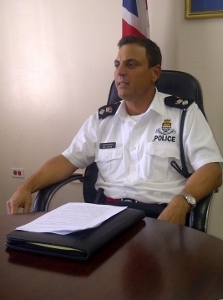 (CNS): Local Senior police officer, Chief Superintendent Kurt Walton, has taken a step closer to securing the top job in the Royal Cayman Islands Police Service. He is currently participating in the UK’s Policing Strategic Command course and is confident the hard worked associated with it will benefit not just him but the RCIPS and the wider Cayman community. In a move designed to ensure local officers are encouraged to realise their full potential within the service, the RCIPS said that he was nominated for the specialist course, which aims to prepare police leaders for the 21st century and produce a pool of operationally credible, professional and competent officers who have the potential to be promoted to senior ranks. Police officials said that there are thirty-six people on the course, which began on 13 January and will run until late March. The participants are police officers, mainly from the UK, of the rank of chief superintendent and above. In addition, some public sector executive leaders are in attendance. Walton is one of only two participants from the Caribbean. The themes of the SCC, which is based in Hampshire, concentrate on the three domains of police leadership, including executive, which is designed to create resilient, confident, emotionally intelligent, ethical, politically astute leaders, with clear values and vision, and with credibility as public sector leaders at the executive level. The business side concentrates on creating accountable public sector leaders with executive business skills, able to lead and transform high profile multi-million pound public sector organisations with integrity, whilst safeguarding the public. Finally, professional policing is about qualified operational police commanders ready to be appointed to chief officer roles. Walton said he was relishing the opportunity to share ideas and experiences with other senior officers and executives alike. “It has been challenging and thought provoking thus far,” he said in a press release from the RCIPS. A number of experts conducting the lectures have been carefully selected by the college from a cross sector of business chief executives, professors and senior police leaders, including Sir Bernard Hogan-Howe. "We have demanding daily assignments which sometimes take us into the late part of the night, preparing for the next day. It’s hard work, but I can already see the benefits that this course will bring, “Walton stated. “The SCC presents an opportunity for all of the senior leaders on the course to engage in a demanding and stretching programme in preparation for transition to executive level posts. I’m sure that the experience I gain from this will not only benefit me as an individual, but will enhance my performance as a senior police officer. That can only benefit the organisation and, of course, the communities we serve,” he added. Police Commissioner David Baines said he was delighted that the RCIPS was able to secure a place on the SCC for Walton. “It’s vitally important that our young Caymanian leaders have an opportunity to experience training and development at the highest levels," said Baines, who took the course in 2005. “I speak from experience when I say that Kurt will thoroughly enjoy it, but more importantly it will allow him to develop his full potential and ensure that he is better equipped for any future promotion. We are all working towards the day when local talent take on the most senior positions within the RCIPS,” Baines stated in the release. “The inclusion of a Caymanian on the Strategic Command Course takes us one step closer to realising that goal." (CNS): Eighteen Cuban refugees aboard a 30 foot sail boat arrived in East End on Sunday having already passed through Cayman Brac waters. Officials said that there were no children on board and that the migrants intended to continue their journey once the boat was repaired. Although official Cayman Islands policy dictates that no one is supposed to assist the refugees, it is understood from sources that they were given some supplies to help them on their journey to Honduras. None of the migrants opted to land and it is believed the vessel is now out of Cayman waters. (CNS): A report commissioned by the Cayman Turtle Farm to measure its own impact on the Cayman Islands' economy has recommended that the facility downsize. The report, which was conducted in May last year by PricewaterhouseCoopers and released on Friday, points out that the farm is very unlikely to ever become profitable without a massive increase in visitor numbers and it should scale back its operations. The consultants said their research indicated that a reduction in scale wouldn’t hurt existing visitor numbers but would help reduce overheads and reduce losses. Although the report has indicated the CTF does have some benefits, such as the employment of around 90 people, most of whom are local, and remains Cayman’s most popular land-based attraction, it has little hope of breaking even. Without the more than $9 million subsidy from government, more than half of which goes to pay off the outstanding loan from the redevelopment of the facility, the CTF would be forced to close. In the impact study PwC suggests that the farm could have a greater chance of holding its own if government went ahead and built the berthing facilities in George Town or if it were to find some other way of massively increasing its share of visitors. More than 70% of visitors to the Farm are cruise passengers and mostly from Carnival and Disney ships. However, its share of the cruise visitors has declined dramatically over the last five years by some 50%. Although cruisepassenger numbers have fallen over the same period by around 12%, the consultants found that the fall in the Farm’s share of guests could not be attributed solely to the drop in ship calls but the increase in ticket price. It also reveals that the cruise lines have a 50% mark-up on the trip package they sell to cruise visitors which includes the CTF. In the report, which cost the CTF US$32,000 to commission, PwC created various scenarios where it measured the Farm’s economic impact compared to its government subsidy and found that it has some benefits to the tourism economy. Pointing to its conservation efforts, its employment of locals and its attraction as part of a package of land-based tours, the consultants found it was worth around $40 million over 15 years. With the cruise berthing facility, PwC’s research indicates that could increase, but the consultants warn that the Farm’s heavy dependence on cruise visitors makes it vulnerable. Although seen as an important part of the package of attractions, the consultants warn that the CIG needs to begin thinking about more attractions if it is to make the berthing worthwhile and there are still no guarantees that the CTF will ever become profitable. When it assessed the Farm’s position, PwC also considered the conservation efforts, including the turtle release programme, which has since been suspended for at least three years as research work is being undertaken to measure the release impact on the turtle population and the potential dangers to wild turtles. PwC does suggest, however, that stopping the subsidy altogether would cause further losses for government as closing the farm would take twelve months and government would still have to pay the loan. 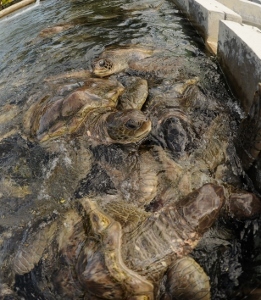 Ever hopeful that the Farm still has a future as an attraction and not just as a supplier of local meat, Tim Adam, the managing director of the facility, said in a release that with government going ahead with the cruise berthing facilities, the Cayman Turtle Farm would be able to increase its visitor numbers significantly. “The key numbers show that, especially in the scenario of having cruise berthing facilities, there are large economic benefits from the government subsidy to enable CTF to continue operating and having the positive net impact on the wider economy and employment in Cayman. In addition, CTF also provides other benefits in its role in conservation and maintaining our Islands’ cultural and social traditions,” he said.